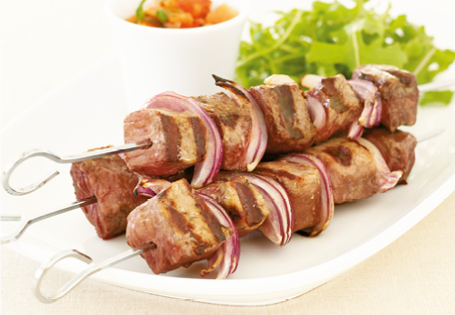 Thread diced beef and red onion wedges onto metal skewers. Lightly brush each skewer with oil. Season with salt and pepper. Preheat char-grill pan to hot before adding meat. Cook beef skewers on 1 side until moisture appears before turning. Cook for 2-3 minutes on each side. Remove from the heat and cover loosely with foil. Rest skewers for 3 minutes then serve with warm tomato vinaigrette. To make the tomato vinaigrette: Heat the oil in a small pan and add the tomatoes, garlic, sugar, salt, pepper and parsley. Cook over a high heat for 1 minute to soften the tomatoes. Stir in red wine vinegar.